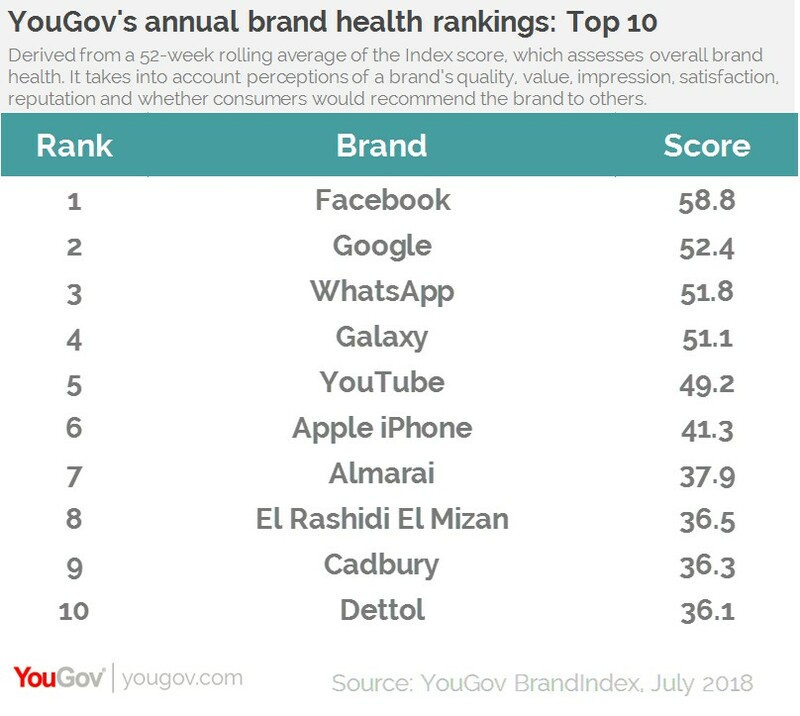 on July 26, 2018, 11:03 a.m.
Facebook again tops YouGov BrandIndex’s annual brand health rankings for Egypt. Search giant Google is in second place, with messenger service WhatsApp in third. 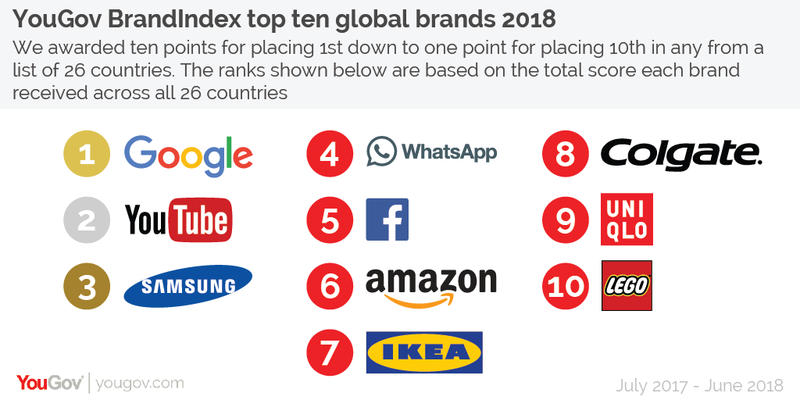 Streaming service YouTube and Apple’s iPhone slip down two places to the fifth and sixth position, respectively. However, Galaxy – the chocolate brand, has made an impressive entry into the list at number four. 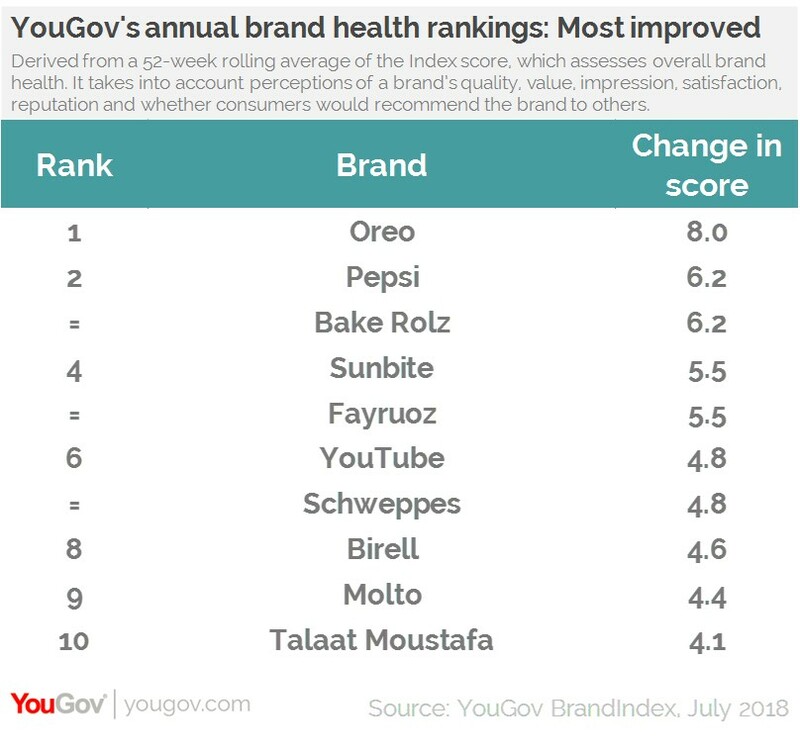 The rankings are based on the YouGov BrandIndex score, which measures overall brand health. The score takes into account consumers’ perception of a brand’s overall quality, value, impression, reputation, satisfaction and whether consumers would recommend the brand to others. New entries include leading food producer El Rashidi El Mizan in eighth spot, Cadbury (ninth), and Dettol (tenth). Food and beverage producer Almarai moves down two places to the seventh position. For the second year in succession, biscuit manufacturer Oreo has seen the greatest improvement in brand health among Egyptian consumers, increasing its score by +8.0 points (moving from 21.2 to 29.2). Pepsi has also been steadily improving its perception over the last 12 months. The brand’s Ramadan campaign last year generated a lot of noise and was a big hit among the masses. Pepsi is the most positively perceived brand in the beverages category and is in second place on the overall improvers list (increasing its score by +6.2 points).